Hi, I’m Ed Marsh. I’m joining you from an enormous trade show during the peak of the fall trade show season. Large industrial trade shows have a lot of attributes in common – because the exhibitors and visitors often share many commonalities. In this particular case the show is PackExpo – it’s at Chicago’s McCormick place where it is held every two years. This year the organizers are expecting more than 50,000 visitors and there are more than 1.2MM square feet of exhibit space. The rate for space at this show is $29/square foot. So booth rental for a small, 20X20 booth would be about $12,000. According to ExhibitsUSA a general rule of thumb planning number is that the total budget for a show will be about 3X the both rental cost. In this case, for a small booth, a substantial and speculative cost of $36,000. That assumes that any equipment that’s built for the show will be sold for a profit, etc. And I hear from one exhibitor after another that the number and quality of leads is declining. Many folks tell me that shows are changing – after all, nobody can just walk a 1.2MM square foot show looking for inspiration. BUT…shows are strong and many are actually growing. That begs the question, why? If they’re very expensive, and not a great lead generation source, why do companies feel compelled to participate? Or said differently, if they’re not getting as much lead value as they used to, why do they take their sales force out of the field for a week and incur the expense? People like knowing who they’re doing business with. Sure there’s an element of touching and feeling of products, and there’s the ability to bring multiple members of a buying team to look at 4 or 5 potential solutions very efficiently. 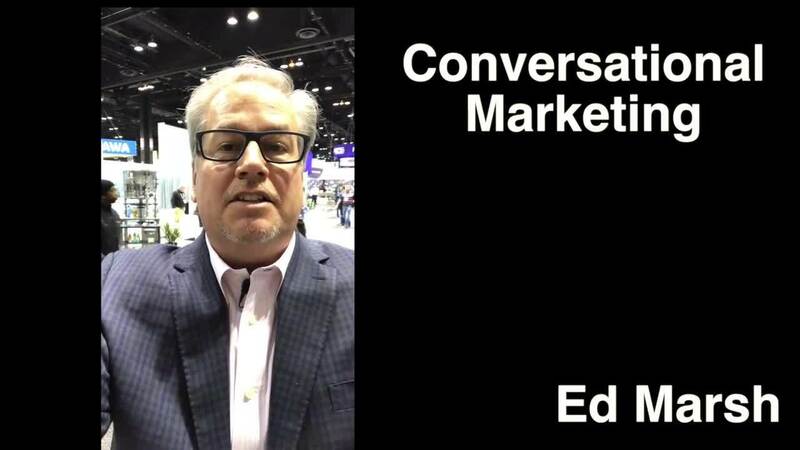 But the trade show experience is about connecting person to person – and I have manufacturers routinely say, we didn’t get many leads, but we had some great conversations with target accounts. 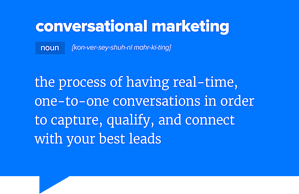 You might even call it conversational marketing. That’s the core of business in many ways – and it’s one that folks lament is too often overlooked with today’s emphasis on websites and digital. But, as I stand here with this bustle of activity in the background, I’m struck by how conversational marketing is being reintroduced to the digital world of industrial B2B marketing, sales and service. It stands to reason that if someone who’s interested in buying capital equipment comes to a trade show to interact personally with sellers, that they’d appreciate the ability to do that online too - and it’s one of those “smack your forehead” kinds of moments when you realize that it should have been blindingly obvious….but it wasn’t. I speak frequently about changing buyer behaviors, and how the internet has enabled them. Sellers frequently complain that buyers hide in the shadows of the internet, creep on websites and deliberately avoid contacting the seller. But here’s the question for you - Is it the buyers fault? Or is it the sellers? Who’s created a “contact us” form with 17 questions on the last page on their website – and then relentlessly hunts down anyone determined enough to submit it? Buyers are just reacting rationally. Why would they voluntarily subject themselves to that experience – the absurd form, or dodging the formulaic voice mails and automated emails? The irony is that as sellers complain about anonymous buyers, they’re in fact forcing buyers to behave that way. Kudos to the folks at Drift for pushing the dots close enough together that it’s helped lots of us see the opportunity in conversational marketing. They’ve taken a Live chat base and completely enriched it to enable real-time digital dialog. They’ve added tools including personalization, rapidly evolving chat bots, conversational landing pages, integrated sales rep calendars, ABM or account based marketing tools, native integrations with other elements of the common digital marketing tech stack, and even email integrated into playbooks. As a Drift partner I’m able to watch this evolution from a different perspective and it’s clear to me that there’s a really interesting opportunity for traditional industrial manufacturers to bridge a technology gap. These companies believe in working person to person – belly button to belly button. Trade shows and meetings on factory floors are how things are done. That’s in conflict with stagnant websites. Sure, websites useful to research information, but they’re unsatisfactory for both buyers and sellers who want to have a real-time dialog. Drift’s tool kit for conversational marketing, conversational sales and conversational service could be a leapfrog technology. In other words, like many developing countries skipped landline phones moving straight to mobile, I think when B2B industrials discover this opportunity they’ll simply skip some of the interim website practices. Certainly there’s some learning and some adaptation required. Many folks hesitate about the live chat experience. They don’t realize that we can route by the industry, size, location or account owner of a visitor – or by their status as an anonymous prospect, known prospect, target account, customer or more. They also might not realize how advanced chat bots are – and how they streamline capturing visitor info while simultaneously accelerating lead qualification. And they have no idea how simple it makes it for qualified visitors to schedule an initial call with the proper sales rep – all in just moments without days of follow up and back and forth. I’ve had people worry about staff to manage incoming chat. My wise guy response is whether they’d manage to figure out how to answer an increase in qualified buyers calling by phone. The answer is o”f course.” So the hesitation about chat inquiries is really just a different method. They also often aren’t aware of how easy it is to route to groups in marketing, sales or even service, or how after hours and off line routing can step in quickly. It’s always interesting when I see a traditional B2B industrial company suddenly “get it.” They realize how chat will support sales, drive leads and provide a welcome opportunity for both buyer and visitor to connect real time – just as they value so much about the trade show experience. Add in the experience it provides for customers too – simple, on demand easy access to knowledge base and service resources, and it becomes a simple yes. Maybe it’s time for you to replicate the valued trade show experience on line – for all your website visitors! Want to learn more? Just run with the bot. Let's schedule a brief call.